I would like to apologize in advance. This article is going to feature screenshots taken on a Windows 7 machine only, which might strike you as odd, given the fact this is a Linux-related topic we are discussing here. But it is exactly why we will use Windows. Nothing like pitch black to demonstrate pure white. Or the other way around. Indeed, LibreOffice 4.2 has been officially released, and it’s a major one. This latest edition of the most popular free, open-source office suite comes with a range of new options, tons of speed improvements, a variety of fixes, and more. And there’s a promise of better support for Microsoft DOC/DOCX formats, which is the Achilles’ Heel of the whole typing world. Can you afford to ditch the expensive payware software and go Libre only? We talked about this in the past, and we will talk about this now. We will start the exercise by creating a document in LibreOffice. A Writer document if you will, which includes some basic styles, some text markup, an embedded image with a caption, plus a comment with multiple lines of text. And when I say multiple, I mean lines with a solid break, not just overflowing text. The next part in the experiment is to save this file in a variety of formats, most notably DOC and DOCX. In real life, most people will be using some version of Microsoft Office to create their assorted documents, and when it comes to written text, Word is the de facto standard. You may not like it, but you can’t avoid it. Therefore, the most crucial bit in this test will be to see how well LibreOffice can handle the export and import of non-native file formats. And no less importantly, how useful and accurate these files are when opened in the proprietary rival software. There were no issues with the binary files. Surprisingly, the fidelity of the conversion was pretty good, and Microsoft Word did not complain when trying to open the LibreOffice-generated file. All of the formatting was preserved, including the multiline comment, which used to be a tricky thing in the past. So progress, at last. Here, things were not so good. Trying to open the LibreOffice-generated DOCX file, Word simply stalled, churning a whole CPU core, but doing little besides. I was forced to hard-kill the process before I got control of Word once more, as well as its associated speed. While stuck loading this one naughty document, Word got really sluggish, and separate instances of the program crawled at a fraction of the expected responsiveness. Not a biggie on its own, or rather very much so, but it sure is a compounded effect of a much bigger issue I was dealing with. In its moment of despair, Word wanted to send me to Office.com to try to open the file, because it was not able to interpret and use the archive created by LibreOffice. Looking around for a source of the problem, the only thing I could find was an application hang reference in the Windows Event Viewer, and little else besides. available, check the problem history in the Action Center control panel. I was not able to load the converted document, under any circumstances. Even when I renamed it, saved it the second time, or anything else. For that matter, opening the file inside LibreOffice also generated errors of its own. The image was not loaded, and the file was simply not usable. I thought there must be a problem with some of the formatting, so I created a second file, using text only, and then, adding an image into the body. Both opened well after being saved as DOCX files, and the overall layout was preserved. So there must be something with some of the rich fields, like comments, which are causing Word to go mad. But either way, this clearly illustrates the random magnitude of the problem that casual users could face when trying to open non-native formats in native software, and the other way around. If you try to save these would-be DOCX files, Word will tell you that it will convert the older format to a new one, where you might face additional risks of losing formatting or data. But it clearly shows that the generic 2007/2010/2013 entry in the LibreOffice Save As dialog is not good enough, and there should be separate entries for each of the three formats. Now, in my previous article, I’ve shown you a better way about this – opening LibreOffice ODT files inside Word, as a workaround to massive problems demonstrated just above. This means you keep the native format, and then you rely on Windows people running Word to guess correctly and open your files inside Microsoft Office. While this does work to an extent, you start the adventure with a number of errors, all of which are debilitating, alarming and destined for failure. First, Word will tell you the file cannot be opened, because there are problems with the content. If you click OK, it will ask you to recover the contents. If you agree, the file will load, with a relatively good quality of conversion. But the difficult part is to bridge the errors. The original ODT file is perfectly healthy, mind. What you get is a decent sort of conversion, except some of the fonts are off, and the scale is not right. As you can see, the image caption is improperly aligned. It can easily be fixed, but it might also disqualify you from a lucrative job position, because someone might think your resume looks unprofessional, with mixed fonts and misaligned text. 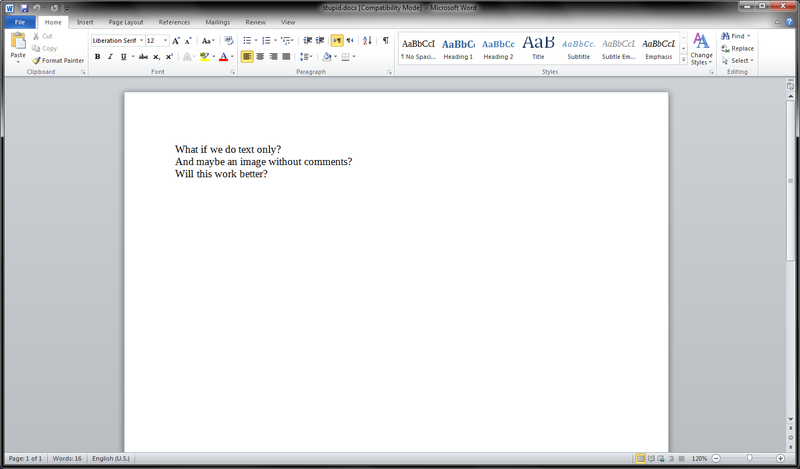 Using LibreOffice as an alternative to Microsoft Office is much like driving hybrid cars. It will work perfectly, as long as you restrict yourself to an odd 100 km commute, with a plenty of recharging stations along the route, and making sure you have a home kit. Otherwise, you’ll be left stranded. Same here. The conversion works, but it comes with a long list of disclaimers that is just not practical for daily use. 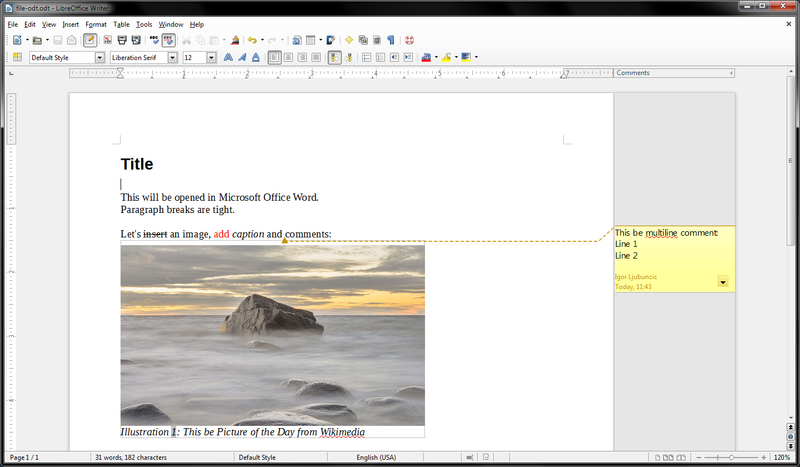 Yes, LibreOffice 4.2 is stunning fast, it’s much prettier, and it comes with a few handy tricks up its sleeve. It’s free too, and it’s a perfectly sane solution, as long as you do not intend to marry outside your village. Cross the border into another shire, and you face big trouble. The conclusion is two-fold then. LibreOffice is a great program for people who use ODT as their primary document format. And LibreOffice is still a terrible choice if you have to share your files with other people, most of whom probably use Microsoft Office. I wish the conclusion was happier, but the magical moment of LibreOffice dominance is still not here. I, for one, prefer Softmaker Office in case I have to use Office software for anything. Not free but multi-platform, fast and great Microsoft Office compatibility. Using LibreOffice on Linux and saving mostly to .doc for people using MSOffice on Windows has worked marvellously for me in the last five years. Had three or four cases of non-compliance, but then saving into .rtf solved the problem. I agree. Switched to OpenOffice full time about 4 years ago and never looked back for any document issues which even included real estate and banking transactions. BTW, there are actually entire COUNTIES in Germany and some other European countries where their Governments have actually made the switch from licensed MS Office to OpenOffice instead. Back in 2008 or so MS sent their VP over there in a panic because some of the counties would not renew their licenses for Office any more. We’re talking about Government structures with tens of thousands of employees across the board who all use the same Office software that’s provided to them. The change is not anywhere near as horrifying as some would have us believe. I find it useful to keep a copy of LibreOffice installed in Windows to open the occasional Mac-created DOC file that Word simply won’t open. After saving in LO, I can then open just fine in Word. I rejoice at the improvements in the LibreOffice user interface – keyboard customization is MUCH nicer (more Word-like). I’m wondering if Track Changes has improved. It was LibreOffice’s most horrible feature. After 7-8 pages of heavy editing, the program would slow to a crawl; much worse, the tracked changes would get garbled with original text. A fatal glitch, making the program useless for shared editing in business environments. LO is a very worthwhile project, gets better all the time but obviously has a ways to go. Beobachter, I could never learn to love Softmaker Office – tried several earlier versions and found Word compatibility problems (poor formatting conversion) and bugs. Never will be as long as they’re imitators chasing Microsoft’s tail. 4.2.1 had several critical bugfixes regarding saving and reading .docx files. You might want to test again. I just keep things simple and use .rtf when sending to a Word user. When it comes to using headers and footers, I have better success with using the doc format over rtf. Being a pro user of MSO but willing to replace LO in future, i am testing each every version of LO and even sometimes i am working side by side with LO and MSO. But at the end LO immensely fails on heavy editing and manipulating large documents at one stage. Also LO has lots of small glitches on compatibility issues. Main stream users need PERFECTION so LO has to go long long way to catch mainstream usage. but i wish the team LO will do it right way and i am eagerly awaiting for that moment. To be fair, compatibility issues are not completely LO developers’ fault, I believe. From a practical standpoint you could argue it’s a moot point. If you’re still around would you mind telling us what happens with large documents, being a curious casual user. And also how large is large. Well. compatibility issues are one very BIG HURDLE while handling complex documents in LO and end users don’t care whereabouts of the faults. Issues are ISSUES and need to be fixed by Q.A. My large documents usually contain 300+ pages with complex formatting. some problems occurred when redoing/undoing some type of formatting, auto adjustment of paragraph elements after removing some formatting in imported documents, etc.. it will be a large one if i go to Calc and Impress. but its not the right place to describe. All i would like to say is Instead of adding new features, the EXISTING issues should be fixed especially for type of Document editors. Becoz, the most of the users of document editors generally don’t have any basic technical knowledge and they expect the same results as doing with MSO. If something goes wrong, they simply rejected as they don’t take any risk on editing their mission critical documents with an open source (free?!) software. Certainly it has its limitations, but I just save as a PDF file when I need to send files to non-Linux users. 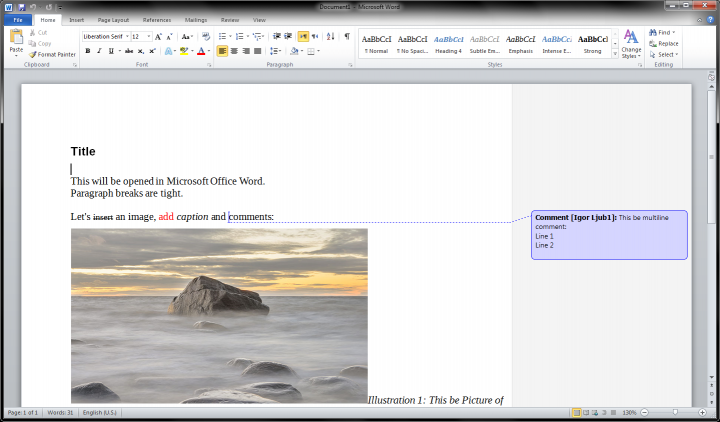 I agree with SoftMaker Office as the best Microsoft Office replacement. Available for a fair price, it is the only office suite that runs all kinds of MSO formats faithfully without formatting losses. Whilst LibreOffice screwed up most of my documents, I never had any annoying issues with compatibility using SoftMaker Office. Anyway, its ui is much more comfortable as well, and SoftMaker Offic runs reliable – without all of these quirks and oddities that LibreOffice is famous for. Igor, you should consider reviewing SoftMaker and KingSoft Office alternatives too. I am really anxious to get rid of Microsoft Office. First off, i really enjoy your work Igor and keep at it. With that out of the way, i must say that i think the test wasnt done in the best manner, and here is why. 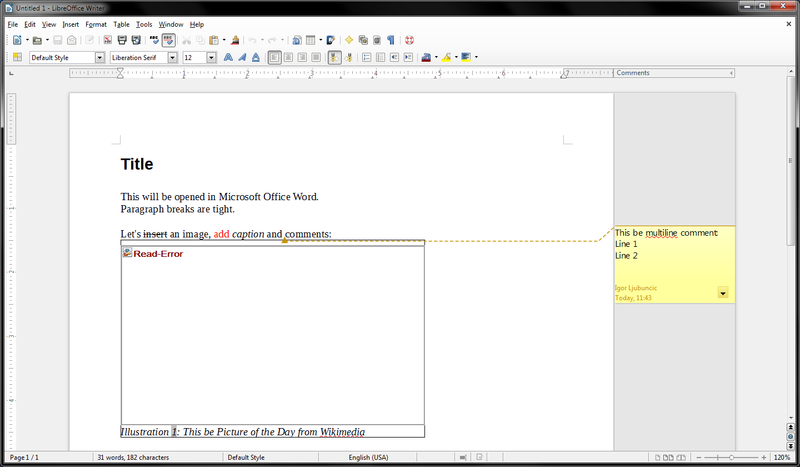 1) If you are testing the latest LibreOffice, I think its only fair to also test the latest Microsoft Office. 2) LibreOffice has both saving of OOXML Strict (titled ‘Open Office XML Text’) and OOXML Transitional (titled ‘Microsoft Word 2007/2010/2013 XML’), so tests should have been done on both formats. 3) Word 2010 only has ODF 1.1 compatibility, so it would have been good to test a ODF 1.1 version of the file. All in all, for the maximum compatibility with MS Office, i’d stick with doc and rtf files. What I hate about LibreOffice is that it’s updating system is stuck in the dark ages. Every time a new version comes out, we can’t update it without downloading the full installer again. Why hasn’t it implemented delta updates? MS Office complains because Libreoffice saves in a newer version of ODF than MS Office supports. 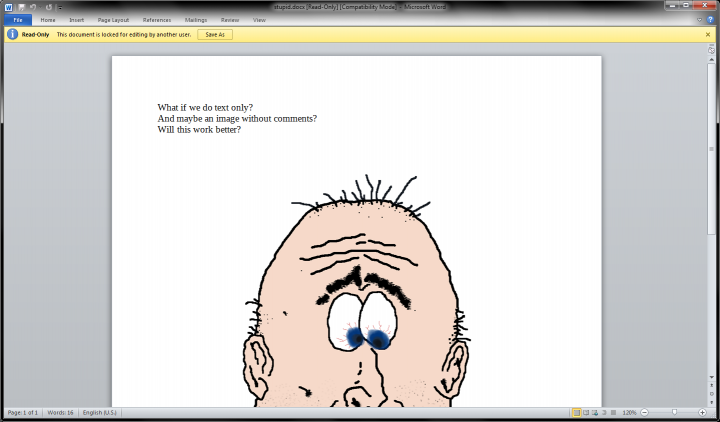 There is an option in Libreoffice to save in ODF 1.1 so Office doesn´t complain. 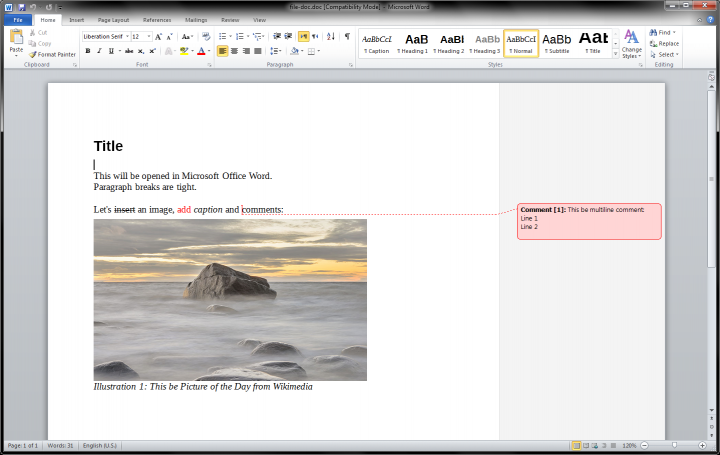 I´m not sure if MS Office 2013 can read ODF 1.2.